Property management can be a huge help when it comes to overseeing your property. It can be used for residential, commercial, and industrial property. Property owners may not think that they need a management firm. However, there are numerous reasons for hiring a manager. First things first, what exactly is property management? It has to do with a property manager overseeing property owned by another entity. This can be any kind of property from industrial to residential, condos to shopping malls. A property manager will act in place of the owners to preserve value while also bringing home income. Property managers also do various other things. They will help owners with budgeting, advertising, collecting rent, and building services – (the latter is where SERVPRO of Ravenswood comes in). The owners of the property will pay a fee for the services the manager provides. It is not uncommon for a real estate broker to also act as a property manager. They are able to offer buyer and seller services, in addition to management services. There are a number of reasons for hiring a property management firm. If you own several rental properties it can be hard to take care of all of them on your own. In this case, a management firm would step in. They would maintain the property, collect rent, and handle tenants. This can be a good thing if you own a rental property for the sole purpose of generating income. You would be able to do this and not have to worry about the smaller details that can be a headache. A property owner who is part of an affordable housing program may also take advantage of a management firm. Many people do this because to be in such a program you need knowledge of federal guidelines. Not everyone is well versed in these guidelines, but property management services are. These services would step in to help the property owner follow the guidelines. In addition to these services, management firms also provide maintenance, cleaning, and construction. The exact services covered will vary depending on what type of property they are managing and how much of a fee they are getting paid. Property management services have many responsibilities, but the main one is maintenance and repairs. The property must be kept in good condition. Managers must take care of physical repairs, including emergency fire and water cleanup and restoration. If your property is damaged by flooding, fire, storms, mold, or something similar your management firm will have to take care of it. This typically means hiring a company to come out, as firms tend to have a long list of available restoration and cleaning companies. 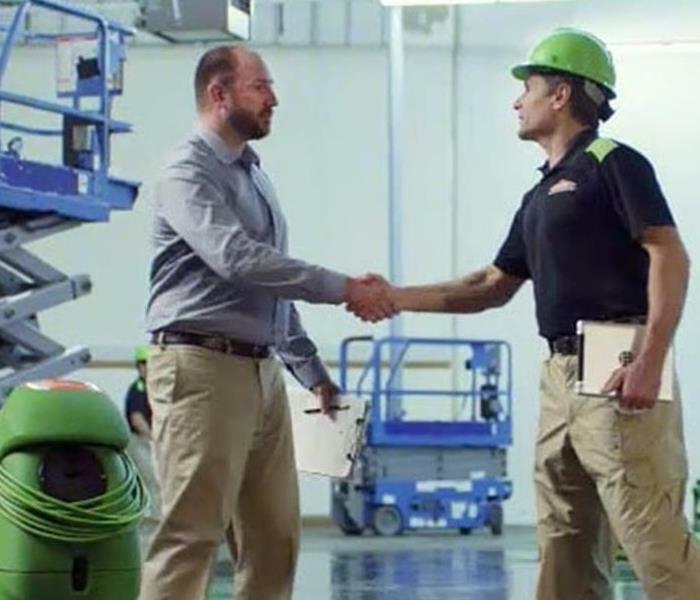 SERVPRO of Ravenswood, a trusted industry leader, may just be the company they hire. We specialize in repairing damage from fires, floods, storms, and mold. Our restoration and cleaning services are available for residential properties as well as commercial properties. Any Ravenswood house fire is devastating in its own right. It destroys your belongings, prized possessions, sometimes entire rooms of your house. 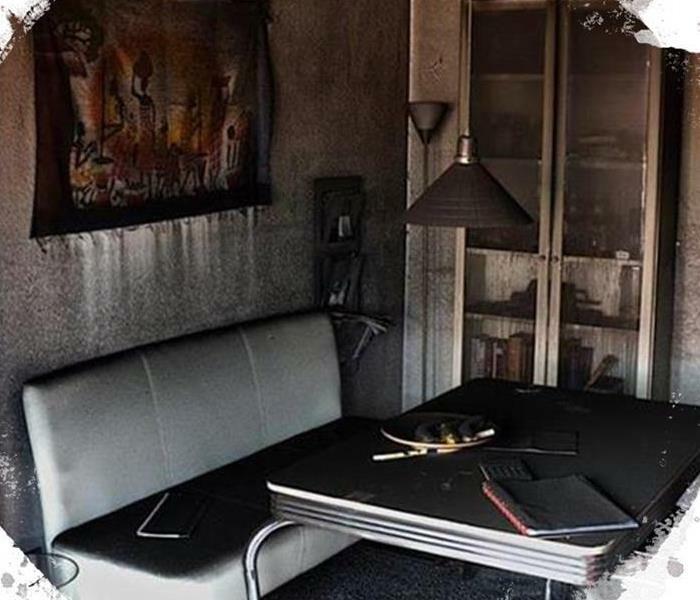 Fires are obviously a tragedy that can completely turn your life upside down, but there is something that accompanies fires that many people don’t think about; smoke damage. Smoke damage Ravenswood can be just as harmful as fire damage and, in some cases, even more so. A lot of people tend to overlook it as a danger after experiencing a fire in their house, but it can have damaging impact if left untreated. While your house might continue smelling like smoke, the damage left behind can cause serious health issues. One dangerous impact smoke damage can cause has to do with your respiratory health. The smoke might be gone, but it will linger in your air ducts, walls, furniture, and many other places. Coming in contact with any part of your house that was damaged by smoke can be harmful. You will be at risk of inhaling soot. This can cause damage to your lungs and sinuses, and lead to bigger respiratory issues down the road. Soot and the residue left by smoke act as irritants to your skin. One big issue they present is drying out your skin, and no amount of lotion can help. You can wash many of your things to get rid of soot and smoke residue, but your skin is a different story. The smoke damage will linger in the air and continue irritating your skin until it has been dealt with. While your skin drying out might not sound too awful, it has the potential to lead to more serious medical issues. A few years down the road, you may end up with severe skin problems that can only be treated by a doctor. Just like the case with skin, soot and smoke residue will linger in the air and irritate your eyes. Your eyes might get red, itchy, and sometimes watery after exposure to smoke damage. While eye irritation might not seem too bad at first, after prolonged exposure yours eyes could be damaged behind repair. It is hard to tell how serious eye irritation is on your own, so it is best to seek out a doctor the moment any symptoms present themselves. The impact of smoke damage after a fire can be serious and cause numerous health issues. That is why you should reach out to SERVPRO of Ravenswood, a Chicago fire cleanup professional, after any Ravenswood house fire to get your home back to normal. SERVPRO of Ravenswood is a leading cleanup and restoration company committed to getting your life back on track. It is our mission to respond immediately to any size disaster, and our trained specialists operate by the “restore first” mentality. That means we will do everything we can to restore your property and belongings to normal so you don’t have to worry about replacing anything. Call 773-878-5200 to clean up any Ravenswood fire damage in your home or business. Tornadoes are a terrifying, often devastating, weather event. They can turn houses into dust, and flip lives upside down. Living through a tornado can be traumatizing, and sometimes the aftermath is just as bad. Parts of your home may be destroyed, and the idea of fixing it can be overwhelming. Recovering from a tornado could be a huge task, depending on how bad the damage was. However, there are steps to take toward recovery and people ready to help along the way. There are steps that should be taken right after the storm passes, and other steps to take down the road when it is time for repairs and cleaning. The first step is to stay in your safe place until the storm has completely passed. If you are able, try and wait until you get the all clear from local officials. After the storm, check yourself and those with you for any injuries. If someone is hurt, the next step is seeking out first aid. After everyone has been checked and is okay, you should see how bad the damage to your house is. Make sure to watch out for anything that is unstable and likely to fall. If you go outside, look out for any downed powerlines. They can be life threatening, so if you see downed powerlines stay inside. After you make sure yourself and your loved ones are protected, start protecting your property. You can make temporary repairs in order to prevent further damage. Many insurance companies will reimburse you for the cost, so make sure to keep receipts just in case. In addition to temporary repairs, living expenses may also be reimbursable. If your house is damaged to the point of you having to stay in a hotel, keep the receipts. Your policy may pay you back for the cost of it. Make sure to make a list of anything that was damaged, and don’t throw out damaged belongings. An adjuster will need to assess them for value if your policy covers replacing them. You should also inspect all utility lines and appliances. Any damage could lead to a gas leak or electric shortage. Damaged electric wires may also cause a fire. You may even have to turn off the main valve in order to prevent more harm to your house. Once these steps have been taken, contact your insurance company. From there, they can work with you to see what your policy covers. Most of the time, they will hire services to come out and repair damages. SERVPRO of Ravenswood has highly trained storm damage specialists, and your insurance company may choose to work with them. We have an incredibly fast response time when it comes to disasters. We have equipment and personnel ranging across 1,700 franchises. Our experience and training will allow us to restore your property quickly and efficiently. In addition, we will document the entire process. 2018 Course: Ready to learn photo! 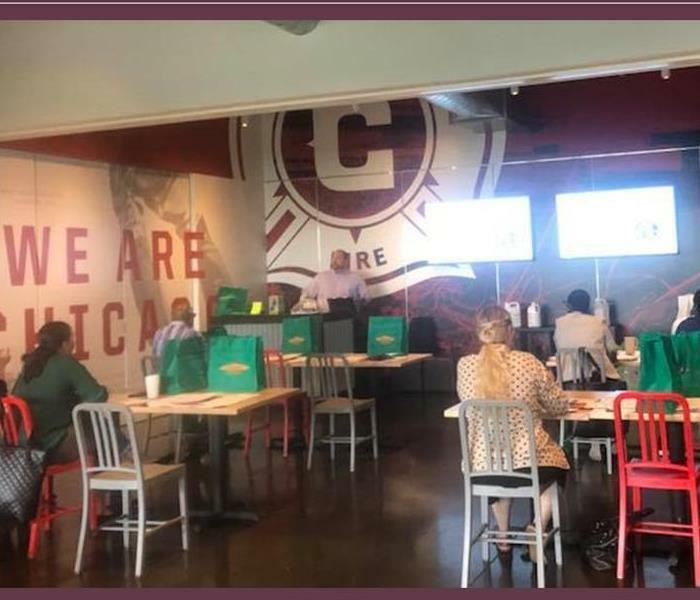 As many of you know, SERVPRO is well known for offering free continuing education classes to property managers, insurance agents and adjusters to help stay abreast to ever-changing cleaning technology in our industry, as well as keep IL insurance licenses updated. This year's Continuing Education course will be held on August 21st. Save the date and location & time will be announced in the forthcoming months. At this time we would like to receive your input on which course you are most interested in learning about. Help us decide which subject to choose. Below is a list of SERVPRO-sponsored course offerings. TELL US which course is important to you. We will tally your votes and pick the one with the most responses. Your opinion is valuable - thank you for casting your vote! Icky - yes! Fixable - yes! Mold remediation is handled by experts Lincoln Square, as these cleanup jobs need to be handled in a very particular way each time. SERVPRO of Ravenswood knows how the process goes because we are trained to know. Lincoln Square property or business owners still wonder about the mysteries behind the mold removal process. Here are five things that may help clear that wonder. Depending on the extent of the mold damage, yes there is a possibility you may have to leave your home or business while the remediation work is being conducted. In many cases, insurance companies will not cover the hotel room expense. During the process contaminants become airborne – having the proper equipment to capture anything airborne is very important. 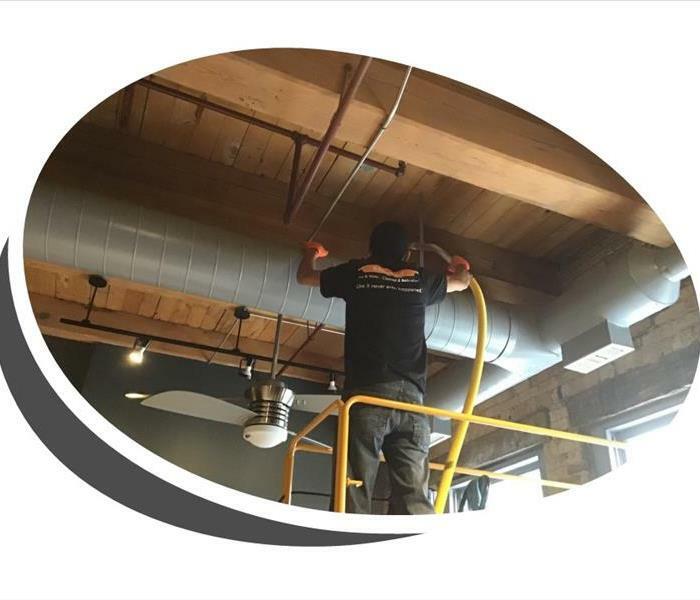 SERVPRO of Ravenswood has air filtration tools that is necessary to prevent spores from spreading and eliminating the chance of breathing it in. The very first thing that a legitimate mold remediation company should do is request a test of the mold to see what spore levels exist in your home or business Lincoln Square. A certified Indoor Environmentalist can conduct such testing. Based on their findings, SERVPRO of Ravenswood will be able to determine the very best way to remediate. Removing all mold from a home or business is impossible. Many restoration businesses advertise “mold removal” and even guarantee to remove all mold. This is a fallacy. Mold exists naturally and is everywhere, indoors and out. SERVPRO of Ravenswood will talk you through everything required in order to cleanup the affected area. We will advise on the how you can help during the process, while we continue with our process. Many times removing wall panels and drywall to applying cleaning solutions designed to mitigate mold Lincoln Square is required. No matter what each step consists of it, all will be explained to you in detail. The best companies will answer all of your questions. Some companies might try to tell you that they’ll remove all of the mold in your house. This isn’t quite the case (see number five below), which is why removal and remediation are two very different things. Remediation refers to taking care of the problem. Removal implies getting rid of all of it. You always want to find an honest remediation company such as SERVPRO of Ravenswood who will tell you how why mold exists and how it can be cleaned. 5) Some specks of mold will get left behind. Though it is impossible to clean up every last bit of mold, our mold remediation specialists will do their best to get as much of the organism as possible and then kill what remains to prevent it from returning. Staining be occur. During the restoration process you can decide whether to remove the mold damaged walls, ceilings or floors or whether to keep and paint over the affected areas. We understand that when mold comes into conversation a sense of panic may overcome you. Please do not worry, rather call for remediation help at 773-878-5200. You will feel better once it is taken care of. After this year’s record-breaking storm, the 2019 Polar Vortex really put our winter preparation skills to the test. The coldest air mass in 34 years created wind chill temperatures to drop between -30 to -60 degrees! That’s almost unheard of in Chicago, but it happened, and we persevered. The affects of the storm however did create much hard ache to so many home owners and businesses in the Chicagoland areas. Luckily, SERVPRO of Ravenswood was equipped to help. Cold temperatures can cause water main breaks and pipe leaks, generating much water damage. 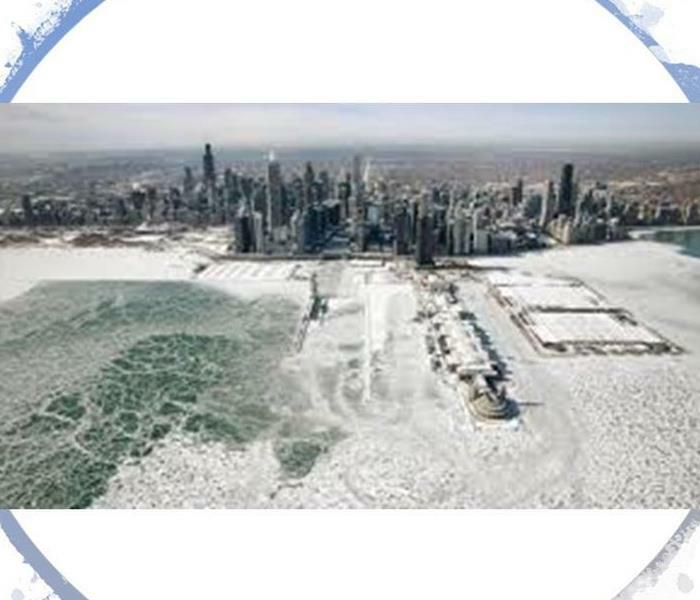 During the Polar Vortex many experienced such water losses. Fortunately for you SERVPRO’s army of green, Storm Team, came from all over America to help us answer the calls, because we know that being put on a 3-week waiting list is not acceptable when your standing in water! Our Storm Team for this particular storm was derived by SERVPRO franchises ranging from Alabama up to California. Our teams don’t hesitate when help is needed, as the support is reciprocated when forest fires are ignited on the west coast or when hurricanes are hitting the coasts down on south and on the east. When you call SERVPRO of Ravenswood our waiting list is short – 24 to 48 hours to be exact. Our prices don’t fluctuate either. We pride ourselves on helping you get back to “Like it never even happened.”, rather than inflating costs out of desperation and making top dollar. Trust, experience and professionalism is our motto. 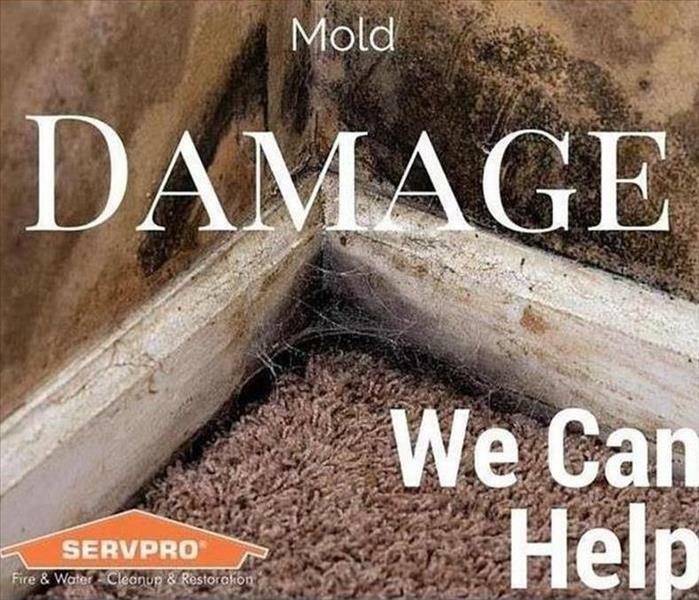 So, when you find yourself in a jam with water or fire damage don’t hesitate to call SERVPRO of Ravenswood. Your calls will be answered, and you will be treated fairly. Let’s set the scene – your home or business has become an object of storm damage. It’s damaged, but not so badly that you can’t move around it and tackle some minor cleaning tasks. What should you do? SERVPRO of Ravenswood is on their way and will be able to handle all of the major issues, but you feel helpless at this moment. Well, there are some things that you can do, Lincoln Square. The number one thing that any storm damage cleanup expert will tell you is to protect your furniture from further damage. There’s an easy solution here – take some bricks, aluminum foil, plastic or wooden blocks and prop up all of your furniture on them. Place one block under each leg. This is great to do, especially if you have wooden legs on carpeting, as the water in the carpet will continue to soak into the furniture. SERVPRO of Ravenswood will need less time drying out your affected area if the furniture is no longer directly on it. If it is safe to do so (and the weather is warm enough) turn on your air conditioning and any fans – either floor models or ceiling units. Air circulation will assist in dry out. Anything that the fans are pointing at will dry faster. Leave these fans on until SERVPRO of Ravenswood arrives. REMEMBER: DO NOT USE ELECTRICAL OUTLETS AROUND AREAS WITH STANDING WATER. Whether the damaged rooms of your Lincoln Square home are filled with art, vases, collectible ceramics, or even model cars, you’ll need to move them into a different room. Choose a room that hasn’t been hit by the storm, or if there are none, pack them up well and place them in the garage or even in a neighbor’s house for safekeeping. You don’t want risk any further damage when cleanup crews arrive. While you may not have access to the professional tools and equipment that SERVPRO of Ravenswood carries, you can still do your best to soak up some of the water. Get some dry clothes and begin to blot the water out of your carpeting, wipe up puddles on tile or wood floors, and do your very best to get rid of that excess water. Once the storm damage cleanup crew arrives, we will take over from there. Although you’ve already been warned to remove breakable objects, you also want to remove non-breakables from the area. Before SERVPRO of Ravenswood arrives, get as many waterlogged items off of the floor as you can. These include floor lamps (but only if it’s safe to do so), books, or anything else that found its way to the floor during the storm. This task will allow more room for crews to begin their water damage restoration process, as well as provide safe passage for your family or friends. Finally, read these tips on What You Are NOT To Do After A Flood, Lincoln Square. Consider shutting off outdoor faucets. Find the shut-off valve in the basement or crawl space and turn it off. Check your business property for downed tree limbs and branches. Weather, such as wind, heavy rain, ice and snow can cause branches to fall, which could cause damage to the property and potentially cause personal injuries. Inspect walkways, and parking lots, for proper drainage to alleviate flood hazard potentials. Inspect all handrails, stairwells and entryways to address and correct potential slippery or hazardous areas. Install mats or non-slip surfaces and post caution signs where water could be present. 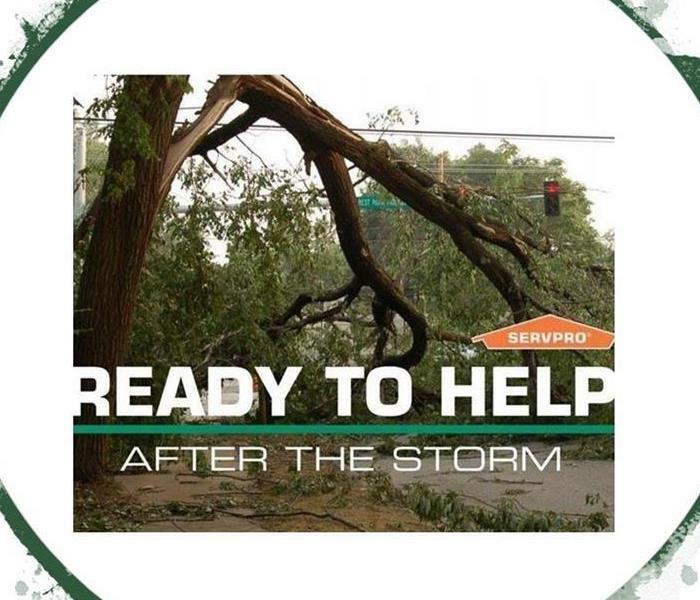 Ask SERVPRO of Ravenswood about starting a Disaster Recovery Plan for your business. Call us at 773-878-5200 today! 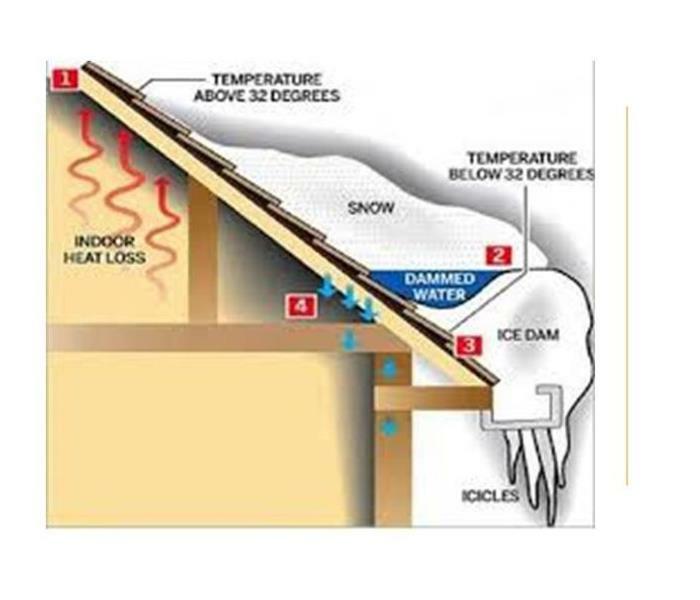 Ice dams can be a major problem during the winter season. They form when heated air melts roof snow downward into water that is dammed behind still-frozen ice. When the trapped water cannot safely flow or run into the gutter system, it can backflow under the roof's shingles and into the structure's interior area, causing leaks and damage. We can help mitigate Ravenswood water damage caused by these ice dams and help you get your structure back to preloss condition. Puffback is a messy furnace malfunction that occurs when an oil burner backfires, sending soot throughout your home or business. It can happen all at once, covering an interior in grimy soot, or a puffback can leak soot particles more gradually. Equipped with the training, tools and experience to quickly and efficiently clean and restore your Ravenswood home or business, we will help make your puffback seem "Like it never even happened." What Do General Fire Damage Restoration Services Entail? The worst has happened. A house catching fire is everyone’s greatest nightmare. Thankfully, your damage didn’t cause any major structural problems, so your home can be salvaged Chicago. However, you do need to hire a fire damage cleanup company Chicago in order to take care of the damage and make your house look new again. Here’s what SERVPRO of Ravenswood can do for you. When a fire occurs, the fire department first responders use water to put out the flames, lots of water! 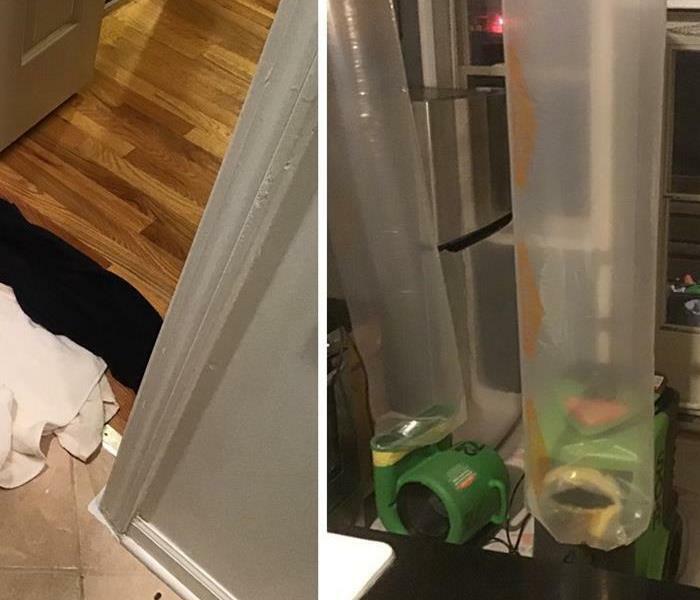 After they give the “clear to enter”, a water damage restoration company, SERVPRO of Ravenswood, can begin their extensive process. Water damage can be harmful if left untreated, as it can lead to secondary damage. If this happens, you’ll need an entirely different type of estimate. Chicago, water damage is handled in several different ways, starting with water removal or extraction. Special equipment is used to remove access water. Any waterlogged furniture is removed from the room and either restored or replaced. The walls are washed down with a special cleaning solution to remove any traces of mold or smoke. Drying and dehumidification takes place right away. This process, depending on the size of the job, can take 2 days – 2 weeks. Be prepared and be insured. After a fire Chicago, there is hope of having your home return to a state of where things look like it never happened. Smoke causes the most damage. It tends to seep into everything, from curtains to linens to walls, floors and ceilings, all of which can be cleaned when you call the pros; SERVPRO of Ravenswood. Our trained technicians will remove debris on walls, floors, and ceilings, and then dispose of it. Depending on the magnitude of damage some pieces may be salvageable while others must be disposed of. Any floors that aren’t covered in carpet may be able to be restored Chicago. Some types of flooring, such as wood and ceramic tile, can withstand quite a few things, including fires. As long as the floors aren’t burnt, buckled or waterlogged, SERVPRO of Ravenswood may be able to restore damaged boards and tiles, clean up any general mess, and even remove the odor from smoke. The carpeting in any affected areas is most likely damaged by water and smoke Chicago. SERVPRO of Ravenswood can handle these issues, although they might not be able to fully restore your carpeting. However, if the carpeting is salvageable, they’ll be able to remove any excess water, clean it to get the odor out, and take care of any residual lingering odors. Call 773-878-5200 for your free inspection! 2/20/2019 - Waiting List! What? 12/18/2018 - What Do General Fire Damage Restoration Services Entail?